Decorating for the holidays doesn't have to be expensive. In fact, it's easy to decorate with items that are virtually free. So this year try putting away the expensive decorations and instead opt for the simplicity of natural materials. 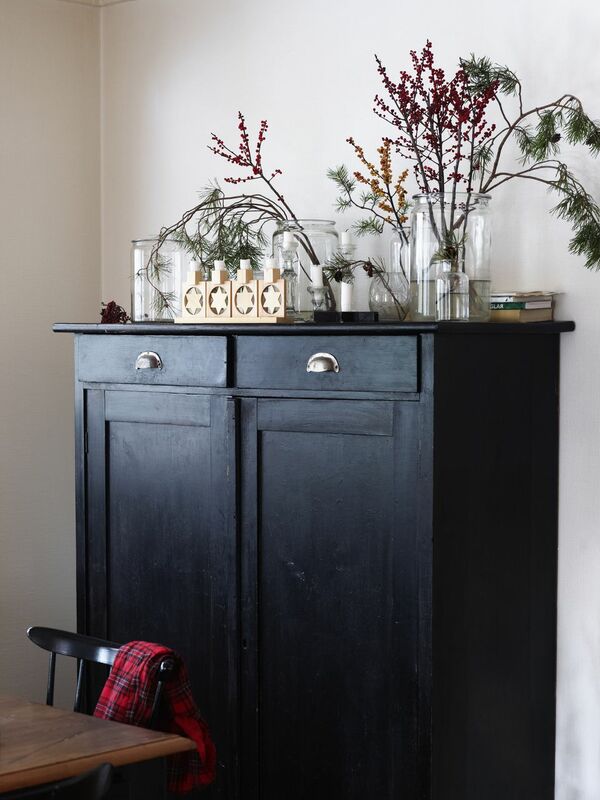 A simple glass jar filled with branches and berries is both elegant and festive. And if you use the right kind of branches you can also fill your home with a wonderfully fresh and Christmasy scent. Even the simplest, most utilitarian items can seem festive around the holidays. These fire logs piled together in the shape of a triangle might not cause a second glance at any other time of year, but during the holidays they take on a certain festive flair. Together with a couple of pinecones they evoke images of Christmas trees and warm cozy fires. Just be careful when you take a log off the top! If you believe that holiday decorations should smell as good as they look, clove-studded pomander balls are the decoration for you. They're inexpensive, easy to make, and they fill your home with a festive and spicy scent. All you need to do to make these all natural Christmas decorations is push the cloves into the rind of a piece of fruit in whatever design you choose. Citrus fruit works best for this project, with oranges being a particularly popular option. Attach a piece of ribbon to add an extra decorative element and provide a way to hang it. Or just display a few in a bowl with some pinecones or greenery. Pinecones are the ultimate fall and winter decoration. They have a unique shape, they're easy to source, and they look good with absolutely everything. So why not tie a bunch together to make a wreath? It makes for a stunning and festive focal point in any room in the house and has a definite country Christmas feel. But that's not the only natural Christmas decoration you can make with pinecones. They can be used to embellish other displays, or they can simply be tossed together in a bowl and displayed on a table. When it comes to decorating with pinecones the more the merrier! If you're into natural Christmas decorations and rustic holiday decor nothing beats a bark candle - particularly when paired with pinecones and twinkle lights. The rustic white bark of birch trees is particularly popular and looks good when placed just about anywhere. Purchase them pre-made or try a DIY version using the bark from fallen branches (never take the bark off living trees). You can also carve out a spot in a small log to place a tea light for a similar effect. If you don't have the space for a full-size tree (or even if you do!) a small container full of lush branches can be a great alternative. Not only does it look good, but you get that natural Christmasy scent as well. If you choose to hang ornaments on the branches try not to overdo it, as a display of this size will quickly become weighed down (both physically and visually). Choose a few favorites and use them sparingly. Most people use cinnamon to add a little spice to foods and beverages, but cinnamon sticks also make wonderful and natural Christmas decorations. There are plenty of things that can be done with them including gluing or tying them around the outside of a candle, tying them together and hanging them as ornaments, and displaying them in bowls with pinecones and greenery. Keep in mind that when you use them in conjunction with candles the warmth releases some of cinnamon's wonderful scent. One of the most common and traditional ways to make use of natural materials around the holidays is with wreaths - especially evergreen wreaths. They're classic, beautiful, and work with every style of decor. These types of wreaths can be embellished with all sorts of ribbons and decorations, but the truth is that they don't really need it. They're perfectly beautiful all on their own. If you want to decorate with natural Christmas decorations there's no better way than with a classic evergreen wreath. Have some festive fun with your fire logs by creating a container in the shape of a Christmas tree. They can be made pretty easily in any size you like by screwing together a few pieces of wood. Just make sure they're big enough to hold all your logs. Embellish the display with a little greenery and you've got the perfect outdoor decoration. Your logs will be the envy of the neighborhood! Decorating with birch logs is a great way to achieve a rustic and natural look during the holidays. And it almost doesn't even matter what you do with them. Arrange them on a fireplace hearth, place them in a wire basket, wrap them in white twinkle lights, or even use them to make candle holders. It doesn't really matter how you display them - their very presence around the holidays will lend a rustic and natural vibe to any room. The rich red color of cranberries makes for a perfect holiday decoration. One of the best ways to display them is with candles. Simply fill a clear glass vase with cranberries and nestle a pillar candle within. You can also add greenery and pinecones if you so wish. If you really want to make an impact make several of these candle holders and place them down the center of a dining table to create a beautiful centerpiece.